WELCOME RACE FANS!!!!! DERBY TIME IS FAST APPROACHING!!! Why are rules necessary? Since one of our goals is character development and learning to follow the rules, we need a complete set of rules governing all aspects of the race.Many times I have seen a pack that has a written set of rules that is ONLY the piece of paper that comes in the box with the car kit. This is like the NFL holding a super bowl with the only rules being about the size and shape of the ball! It would sure make for an interesting game just like that piece of paper as the only rules makes for an interesting Pinewood Derby. 1A)- Width- The overall width of the car shall not exceed 2¾ inches. 1B)- Length- The overall length of the car shall not exceed 7 inches. 1D)- Weight- The weight of the car shall not exceed 5 ounces. The scale used at the Race Day Inspection weigh-in is the official scale. Scales vary slightly so be prepared to make adjustments. 1E)- Height - For the District there is no height requirement. The height of car may be limited to the track’s finish line height. Be prepared to adjust/modify the height of your car as necessary to fit the track. 1F)- The car shall not ride on any springs or other such devices. 1H)- Four Wheels, 2 on each side of the car, will be placed so they straddle the tracks lane guide. 1-1a)- Axles that come with Pinewood Derby model car kit must be used. 1-1b)- If desired, any burr or seam on any surface of axles may be lightly skimmed off with a fine abrasive. 1-1c)- The original diameter of axle is to be maintained. 1-1d)- The axles may NOT be built up with any material and then turned down with a lathe. 1-1e)- Bearings, washers, bushings, tubes or spacers to axles are prohibited. The wheels are designed to be and will be wobbly on axles. 1-1f)- Only dry lubricant is permitted. No oil or liquid spray is permitted. Oil may soften the plastic of the wheels or damage the surface of the track. 1-2c)- The original width and thickness of contact surface must be maintained (The wheels may not be rounded, have a "V" shaped surface, or have grooves cut into the tread surface and cannot be narrowed). 1-2d)- Wheels cannot be altered or replaced with any other wheels. 1-2e)-The raised lettering on the outside of the wheels must not be removed. 1-2f)-The ribs that appear on the outer perimeter and give a look of tread must not be removed. 1-2g)- No holes can be drilled through wheels to remove material and no material can be removed from inside of wheels, except burrs (see rule 1-2b above). 1-2h)- No weight can be added to wheels. 1-2i)- No Hubcaps may be added to the wheels. 1-2j)- Wheels are designed to be and will be wobbly on axles. 1-3a)- Extended wheel bases are allowed. 1-3b)- The minimum length between axles shall be 4 ½ inches. 1-3c)- You may put your own wheel grooves or holes in the body of the car. 1-3d)- The wheel axles must be inserted in the cars body, not added underneath the car. 1-3e)- The wheels MAY NOT extend beyond the front or rear of the car. All cars must pass a pre-race inspection by the Derby Committee prior to being accepted for the derby. A) - The car must meet the weight requirement, not to exceed 5 ounces. C) - The car will be given a number and placed in a starting position according to division and weigh-in time. D) - All weigh-ins are done the day of the race. E) - The car will be impounded immediately after it passes pre-race inspection. F) - No additional work can be done to the car once it is impounded for racing. G) - Please mark “front” of car if the design of the car so warrants, to eliminate confusion and aid the Starter in the placement of the car on the starting line. The extreme front of car must touch the starting pin. If the design of the car does not allow the extreme front of the car to touch the starting pin, the starter will place the car backwards on the starting line. The Starter’s decision is final. H) - All EXTRAS/ACCESSORIES as defined in rule 7-A must be attached to the car securely. Any loose items will be removed before the car is impounded. A) - The car shall be placed in a PIT area on a designated space according to the car number. B) - Race officials will deliver the car to the starting line for the start of each race. C) - Once the car runs the race it will be returned to the PIT area by a race official. 3-C1)- Exception: The Race Committee may determine that the owner of the car may stand by the finish line and return his own car to the PIT area once the race is run. This must be determined before the start of the Derby and must continue for the entire Derby. D) - Once the car has been eliminated from the Derby, only the owner can remove it from the PIT area. E) - Any owner taking his car out of the PIT area, for any reason, once the car has been impounded for racing, and before it has been eliminated from the Derby, will voluntarily eliminate his car from the Derby. A)- The racers and lane assignment are randomly chosen. B)- The cars will be placed on their designated starting lanes with the front of the car touching the starting Pin. 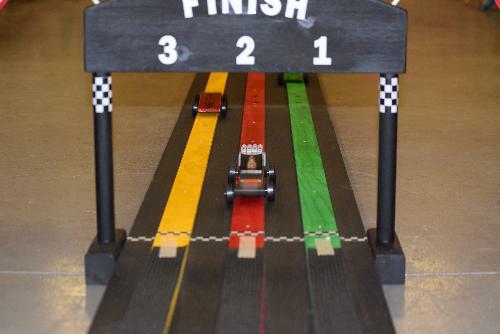 C)- The race winner will be determined by the car whose nose is first over the finish line as recorded by the judges. Race Judge(s) will observe the finish. Any discrepancies are finalized by the finish line judge(s). If judges declare a re run then the heat is to be run again. D)- Each division will complete its racing by determining 1st, 2nd, and 3rd place finishers before the next division race is started. E)- The District Race will be a double elimination race. 4-E1)- All Derby participants will compete in a minimum of two (2) races. 4-E2)- Cars that lose two (2) races are eliminated from further races in subsequent rounds. 4-E3)- When a car is eliminated from further racing it maybe removed from the PIT area by the owner. A)- Heat 1, all cars in the division race will race once down the track. The winners go to Heat 3 and the losers go to Heat 2. B)- Heat 2, (losers from Heat 1, all cars have 1 loss). The winners go to Heat 4 and the losers are out by double elimination (2 losses). C)- Heat 3, (winners from Heat 1, all cars have no losses). The winners go to Heat 5 (if needed) and the losers go to Heat 4. D)- Heat 4, (winners from Heat 2 and losers from Heat 3, all cars have 1 loss). The winners go to Heat 6 (if needed) and the losers are outby double elimination (2 losses). G)- Additional Heats would be run as needed following the same pattern. H)- 1st place will be determined by running races in the above pattern until only one car remains that has less than 2 losses. I)- 2nd and 3rd place finishers will each have 2 losses upon completion of all races. How they finish in relation to each other will determine which car places 2nd and which car will place 3rd. J)- If different cases arise the Race Chairman will decide the race match-ups. His decision is final. A)- An accident will be defined as any car, when racing, leaves it’s designated lane, loses a wheel and/or axle. B)- If during the course of a race a car becomes involved in an accident, The owner(s) of the car and one parent/guardian will be allowed into the PIT area to fix or make repairs to the car. C)- All accident repairs will be made in the PIT area only. No car(s) will leave the PIT area once the car(s) have been impounded for racing. D)- If a car leaves its designated lane and interferes with any other car, the race will be re-run automatically. 6-D1)- The same cars will re-run the race in the same lane designations. 6-D2)- Race Official will grant a reasonable amount of time for owners to make repairs to the car(s) before the race is to be re-run. 6-D3)- The race must be re-run before the start of the next division. E)- If a car leaves its designated lane and does not interfere with any other car, the race will stand. F)- If an EXTRA (as defined in rule 7-A) falls off a car and interferes with another car or is the cause of another car leaving its designated lane, the race will be re-run automatically. 6-F1)- the EXTRA, causing the violation, will be removed for the remainder of the Derby. H)- All repairs will be done under the supervision of a race official. I)- NO race official is allowed to work on cars. Owner may place EXTRAS/ ACCESSORIES on the car, such as but not limited to: i.e. a fake steering wheel, a driver, a seat, windshield, air scoop, rear fins, side pipes, fenders, etc. A)- An EXTRA/ACCESSORIES is defined as anything added to a car that did not come with the Official BSA Pinewood Derby Car Kit. B)- Lead weights are considered an EXTRA. C)- Owners must conform to the general rules regarding the length, width and weight guideline when adding these EXTRAS/ACCESSORIES. D)- Owners will be permitted into the PIT area, ONLY TO REMOVE an EXTRA that becomes loose, unattached or broken during a race. Owners cannot work to repair or re-install an EXTRA once the car is impounded for racing. E)- If during the course of any race the EXTRA(S) become dislodged, unattached or falls off, and does not interfere with another car,this is not considered an accident and the race will stand. Refer to rule 6-D.
10)- Ultimately the decisions of the race committee and/or chairman on any of the above rules are final. Un-sportsmanlike or un-scout like behavior by either parent(s) or scout(s) will be immediate grounds for disqualification of the car and removal from the event. Here is your chance to really strut your stuff. Cub Scouts, Boy Scouts and their family members (this means Moms, Dads, and siblings) may choose to enter the Outlaw Race at the Pack Derby. The cars must meet the weight requirement of 10 ounce maximum and must not be powered by any means, no flammable liquids, but are not subject to other rules. This is not a design competition, this is all about SPEED!.